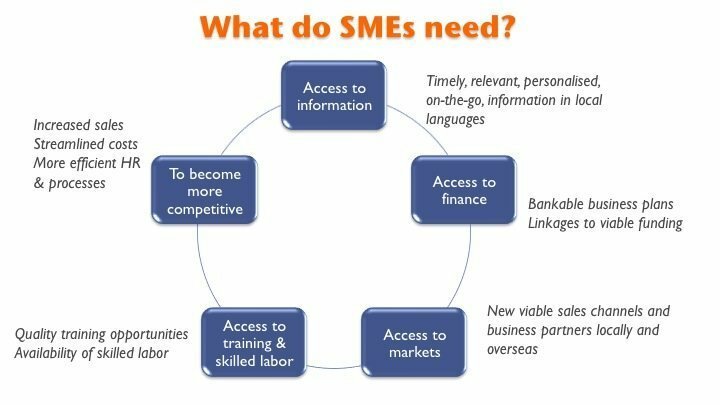 So What Are SMEs’ Shared Challenges? We call the diagram below an SME “needs wheel,” because the needs are structurally interdependent, and the challenges and potential solutions mutually reinforcing. Professionals in the SME development field are intimately familiar with these challenges. And the good news is that various development institutions have been tackling some of them successfully in specific markets. So the question is: why hasn’t the international development community been better at implementing successful solutions more broadly? The Obsession with Innovation: Is It Part of the Problem? What this raises for us is a fundamental methodological question: whether there is currently too much emphasis in the development world on program replicability and too little emphasis on program replication itself. In other words, it’s common practice for major donors and development organizations to announce that their innovations (whether for SMEs, health, education, climate change, you name it) will serve as proofs of concept potentially replicable in other markets. But in our experience it’s much less common for a development organization to take one of these “replicable” models developed by a different organization and implement it themselves. Imagine, for example, if the World Bank, rather than investing primarily in designing new solutions to SME challenges were to replicate proven, successful “replicable” programs developed by the Asian Development Bank (ADB). Or if the U.S. Agency for International Development (USAID) were to replicate successful climate mitigation solutions developed by the African Development Bank. In a world where innovation is prized above reproduction, experimentation above mere cloning, at a practical level it sometimes seems a shame that more stress isn’t placed on inter-organizational collaboration, co-investment, and program replication. Let’s be clear: we’re not Luddites. There’s no doubt that smart, strategic innovation can change the world. Innovating–both technologically and strategically–is at the very heart of what we do at Emerging360. But with dwindling development budgets, what we should definitely not be doing is innovating for innovation’s sake. Of course, inter-organizational replication and co-investment are happening in the development field. But are they happening enough? What do you think?